An ocean bait-ball is the salty equivalent of a full-on mayfly or giant stonefly hatch. There's a wild atmosphere, a feeling of abandon: Birds screaming and swooping, big fish throwing themselves out of the water in fits of enthusiasm, angler's casting furiously. At the centre the cause of all the fuss. How many? Hundreds of thousands? Millions? Probably best to just think in tonnes. Yes, tonnes of tiny fish. The bait. I don't think I really understood the compass of the word "shoal" until I saw a bait-ball off Martha's Vineyard. Packed so densely that the water looked black, this shoal of bay anchovies covered an area the size of a football pitch. The dark smudge drifted along the coast, tracked relentlessly by terns and gulls, stripers and bluefish, centre-consoles and skiffs. When the bluefish get to work razoring through the hoards they create a protein-rich oil slick, smoothing out the waves above the shoal. A calm above the storm. I remember standing in the waves one day waiting for the False Albacore to arrive, thigh-deep in baitfish. 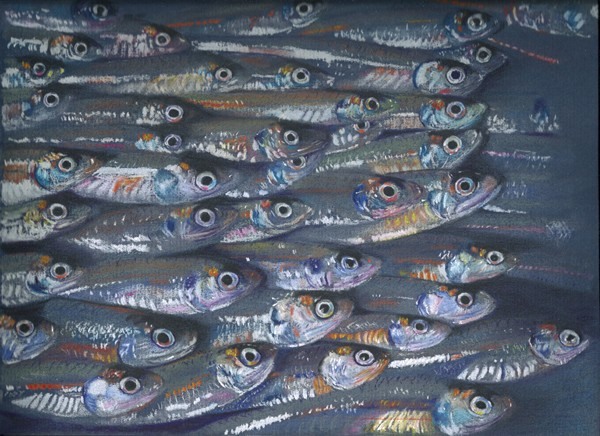 There truly seemed to be more fish than water, rippling along the beach like wind-blown long grass. Aside from a general sense of awe at the amazing fecundity of the sea, seeing these shoals made me realise just how much we have lost over here in the east Atlantic. They used to say you could walk across some Cornish bays without wetting your feet as you slid, like an inebriated ice skater, across the backs of the sardines packed against the shore. We used to have so many herring that huge bluefin tuna called the North Sea home and there was a big-game charter industry in Hull and Grimsby. Big-game, in Hull and Grimsby! It sounds like some kind of joke doesn't it? It is. The joke is on us.